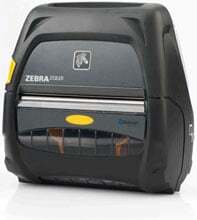 Zebra ZQ520 - 4" Mobile Direct thermal Printer, 203 dpi, Double-sided Tear bar, Bluetooth Interface. Apple iOS, Android, Windows Mobile and BlackBerry compatible, Battery and Charging Cables Not Included. Extreme environments and bangs and bumps are no match for these lightweight, compact printers. Zebra's ZQ520 printers are the most rugged printers available. They perform in the widest operating temperature range in the industry and can withstand repeated drops to concrete from up to 6.6 feet. Water spray is no match with their IP54 rating. 4" x 6" Direct thermal paper Label. Permanent Adhesive. Compatible with ZQ500 Series. 75 labels/roll, 36 roll case. The Zebra ZQ52-AUE0000-00 is also known as ZEB-ZQ52AUE000000	or ZQ52AUE000000	.